Here is a list of washer error codes for Amana, Asko, Beko, Bosch, Daewoo, Fisher & Paykel, Frigidaire, GE, Haier, Hotpoint, Kenmore, LG, Maytag, Samsung, and Whirlpool. These fault codes are for top loading washers and front loading washers. This list may not include your specific error code. If you cannot find your washing machine brand and or error code below, go to the bottom of the page and ask us. We will be happy to assist you with your washing machine error code and can help you to troubleshoot your specific washing machine issue. If your washer error code is found below, this error list will tell you what part is faulty or has failed. This list is based on the washing machine manufacturers list of error codes. NOTE: For more Washer error code details and information, click the WASHER BRAND NAME link to go to the specific washing machine error code page. I have a Midea USFC70-DS12DSH and it is displaying ERROR55 can any one tell me what that means I looked in my manual and it is not even listed. I was running a dryer cycle and it just stopped. I notice in the comments before that someone had asked about this but there was no reply. E5, what does this mean and how can I fix this,thank you. Hitachi S F H 800TPX wash machine 15 years of excellent operation, now receiving F P error towards end of cycle as though computer board not correct, If I did on/off and start pause button down together will it reset and end the problem. F9 is coming on after Deep 1 completes and changes to spin. My Kenmore (Fridgidaire) front load washer won’t spin dry at the end of the cycle. I’ve cleaned to tub to pump hose, and I’ve ordered a door switch, but in doing a dignostic I get a P47 code, which I finally see it a “board thinks PTC switch is open”. How do I fix that? Should I cancel the door switch and order a board? Thank you! We have a Mabe top loader. Mabe is GE in Mexico. It blinks E1. Can anyone please help? I have HiSense washing machine with front loader with XQG70-HE1014S. In the middle of washing every time the washing machine gives F1 error. I have to press play/pause button to resume. In the end around 15 minutes remain to finish washing, it gives again the f1 error code and after pressing play/pause button it doesn’t resume. Hi, I have a Defy Top Loader Model DTL115. Error code “LE’ appears just before machine starts to spin. Could you tell me what this error code is? My Maytag top loading machine does not show error codes. It would not spin. I went in line and found instructions. I tried resetting the machine several times. Now the sensor light is flashing. I get that to stop flashing then press start. The red lock light comes on the machine clicks then the red light goes off but the sensor light stays on and the machine will not wash. I have a defy maximaid 800 with er6 code?? What means this code and how can remove that? What is error code 5E or SE for a Samsung front load washing machine? my washing machine is singer swma612egz one. the error says L:RC or L:A.C what’s that? Supra 8kg front loader washing machine is giving an error E05. Whirlpool washing machine 360 degree 7.2kgs top load. I am getting a error LE. Only the LG washers get the L error codes according to our database. Whirlpool washers get the F and E type of error codes. I am using AMBER front loader washing machine it shows an error code E01 and E04 whenever i switch it on. Videocon Front load washing machine showing error code E12 – it says abnormal condition of water draining. Can you help to fix this issue. Have a Sanyo front load xqg60 and getting error code E904. Any ideas? I have a Midea US-FC70-DS12DSH front loading washer/dryer combo with error code E55. What does that mean? My 10 year old top load Hitachi showing error code E1, and water will not drain out. Please help! I have a samsung front loader. It keeps dinging and has a capital backwards E and forwards E. I cant figure out what that means. Error code E1 on Whirlpool white magic top load machine. I have Toshiba hydro twin power AW-1171UBB Washing machine. It is showing error 4/7 so what does it mean? Please tell me its solution? Press all the WATER FLOW button, PRESET button, and RINSE button to reset it. My Aifa washing Machine have an E2 display. unable to rinse and Spin. I have a Mabe washer model number lmh79104wbab. I just want to know how to reset it? Frigidaire front loading Washer E30 Error Code. I would like to know what needs to be replaced, I have some info about the drum overfill. My LG 5kg direct drive front load washing machine refuse to start even though every button is working and there is power, I have tried everything except the door lock. I have a very old LG front loader 5kg load. Did washing but the next day when I wanted to do a load it refused to start the cycle. All the lights start flashing. I have tried switching off, unplugging and pressing start pause button for 5- 10 seconds. Defy daw327 front loader washing machine. I get an error 63 and it won’t spin the drum to wash, it takes water and nothing else. I have a Hisense front loader washing machine model XQG1014HR. My CROMA CRWA1105 shows error code E2. The washing machine stopped halfway with clothes and tub full of water in it. amana front loading washing code lc; what is it? thanks. My Cabrio washer when i get to the error fault code the only one that appears is 46. I can’t find that code anywhere. When i try to start my washer the dl code appears but it is in fact locking. So you are getting both the 46 and dl error code? Check for anything keeping the door from closing. Is the Cabrio washer working, or are the errors codes showing and preventing it from running a wash cycle? Can you give us the model number of your Whirlpool Cabrio Washer? We have top loader washing machine ITALIAN CHOICE ARISTON MODEL: WTV 7F VN error shown “E2” but we don’t have manual. We don’t know the equivalent fault of this code. Can you check further and see if it is built by Miele? Do you see the Miele Logo on the washer anywhere? How to fix error code H1 in IFB garment washing machine ? Error code for Teco twm75fa washing machine has error code E11. What is error code for? TECO Washing Machine Error Code E11? The error code E11 for Teco Washer TWM75FA is not in the database. You should contact TECO Service and ask them what the error code is as they do not seem to have any Troubleshooting manuals on their website. May i get the error codes table for electrolux washing machine w41100h. What could be wrong? We get an error code that reads bd34? It looks like half of a “b” followed by d34. Your WA5471 Samsung washer may have a faulty board or sensor if you have to redistribute at 11 minutes and reset the spin when it reaches 15 minutes. The DC error means the load is not balanced. The BD34 or D34 error code is not in the database. Can you check again and be sure of the error code? 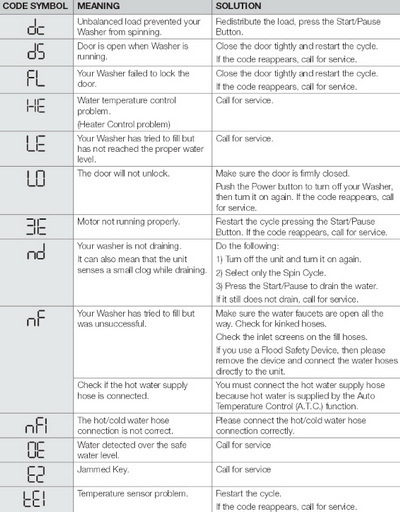 Here is a list of error codes for your Samsung washer WA5471. I’m getting a F5 reading on my Kenmore 600 series washing machine. I can hear the lid lock trying to unlock and it is already unlocked. What can I do? Hi I have a Midea front load washer that came up with E11 code have drained water out and check drain hoses were not block and adequate water intake. door is now still locked (help with clothes in it) and will not reset. I have a LG Tromm front load washer showing DO error code, door open. How can I fix it?. The door switch assembly on your LG washer may be faulty. Is anything blocking the door? Check the wiring harnesses that go from the door switch to the control board and be sure they are secure. I have a Beko front loader and its showing an error code E 12. Can you please advise how I might be able to fix this issue. I have a Toshiba washing machine and when i turn on the machine on screen shows Error code E7-4. Can you tell me how can I fix this? Toshiba Washing Machine Error Code E7-4 is a sensor error. This error can be fixed by resetting the washing machines control board. -Press the WATER FLOW, PRESET and RINSE buttons at the same time and hold for 5 seconds. -The lights on the control will come on or flash. -This means that the washer is in diagnostics mode. -Once the washer is in diagnostics mode, release the buttons and wait 5 seconds. -Press the cancel button or the power off button to reset the control board. -Once the washer is OFF, unplug it for 15 minutes. -Plug the washer back in after 15 minutes. -Test the washer to see if the board reset. If the washing machine works then you fixed the problem by resetting the control board. If the washer does not work and you continue to get the E7-4 error code, you need to check/replace the sensor or the main control board. I have a Fisher and Paykel front loader washer with SUDS lock coming up. What do I do? Fisher and Paykel Front Load Washer SUDS LOC. Washing machine has detected = Too many suds. Machine will stop and flash “Sud LOC” for 10 minutes while waiting for suds to dissipate. The machine will not beep during this time. After 10 minutes the machine will automatically restart. At any point during that 10 minutes you can press START / PAUSE to restart the machine, but it is recommended that the machine be left to restart automatically. Check the standpipe height for the drain does not exceed 1200 mm. I have a Maytag stackable washer/dryer and the washer just stopped working. The model number is LSE9904ACE, there is no manual available through the maytag site, only a parts list. It fills up with water but won’t agitate, spin or drain. When I unplug it then plug it back in it flashes a 1E (or IE maybe) error code. I can’t find much information (or the manual) online, any chance you can help? If it is the lid lock, any idea what part it is I need to order? or… how to reset it, hoping that might work too but can’t figure out how/where to reset it. The unit has an electronic display on the bottom of the dryer and I can’t find any obvious switches anywhere. I found the lid switch part number, 205415, and am ordering one on amazon, hope it works! Have a Whirlpool cabrio has a code of 5d during the spin cycle. It seems everything slows down and the machine keeps adding water. I have an ASPIRA Washing Machine Model Number TWLWP60 and it is showing error code E3. The ASPIRA washing machine does not spin. The display shows E3. Has the laundry been placed unevenly in the machine? The machine will start 10 seconds after being levelled correctly. I have a 9 year old Whirlpool front load washer. Error code F 21 code shows up when washing halfway through. The code will not clear and the door is locked. It is a Whirlpool model wfw8500sr00. Whirlpool front load washer Error code F21 identifies a DRAIN ISSUE. First try cleaning out the drain pump filter on the front bottom of the washer. Unscrew the cap and clean it out. This should fix the NO DRAIN issue on your Whirlpool Front Load Washer. If not, check the drain hose at back for bends or blockages. E4 error code for Defy DTL142 Washing Machine. DEFY Washing Machine E4 error code means that your tub is off balance. Turn the cycle off and then rearrange the clothes and try again. My kenmore 3.5 front loading machine pause/cancel lights flash and beep 9 times in a row /stop/ beep again 9 times/ stop , etc. and it won’t start. What is the error code for this? Is it fixable or time to get a new washer? What does error code f0043 mean on a Miele WMB120 washing machine? Is it F43 or does it appear exactly as f0043? Sears, Kenmore – Elite, front load washing machine made by Samsung. Machine malfunctioned three days after the one year warranty expired. Issue appears to be with the spin cycle error code shows 8E have been unable to determine what that code means? My daughter has a top load Haier model #jw k42w. It keeps reading error message FA. Even after unplugging and the replugging. She purchased three months ago at a refurb shop. She lives in Japan and is primarily on her own. What does the error code DS mean on a top load GE Profile Washer? The error code is really D5 not DS… this is a common problem as the 5 looks like an S.
This indicates a lid switch malfunction. Fix the “D5” error by powering off the unit, wait 10 minutes then power it back on. If this does not fix the issue, remove and replace the lid switch. I have a BOSCH BMC model BTWM 451 washer and it constantly brings up error code E3. Can you tell me what fault this code points to? Bosch Maxx Classic Front Load Washer error code E3 means the door isn’t being registered as closed. This is normally due to a faulty door interlock switch or wiring issue. Check wiring and if needed, Change out door interlock switch. Thanks, This helped my front load LG washing machine to properly work! I keep getting an E3 error on my Midea washing machine. Do you know what this might be please. Please check our Midea Washing Machine Error Codes page for error code definition. Please let us know the model number of your washer showing the 3 lines _ _ _ and we can assist. I have a Samsung WF 210 washer with two codes showing. F3 and 2D. I can’t find them anywhere. It will not drain on its own. The F3 and 2D error codes do not relate to the Samsung WF210 washing machine. Try doing a diagnostics quick test using the user manual for Samsung WF210 Washer here. Once the PDF user manual opens, scroll down (PAGE 4) to where you see the control panel display for your WF210 washer and below that are the instructions for diagnostic mode. Running through diagnostic mode will show you what may be the issue. Amana washing Machine will not fill. Tried to get error code but no luck, now fill light flashing… Have replaced Water control valve still will not fill…. Any ideas? Make sure your hot and cold water faucets are turned on. Both hot and cold water must be connected to the washer. The washer won’t work properly with only one incoming source of water. Make sure your drain hose isn’t kinked or clogged. Straighten the hose for adequate water flow. Remove any blockage from the drain hose, drainpipe or utility sink. Use the U-shaped hose form to secure the drain hose. Are your water inlet valve screens clogged? Remove any accumulated film or particles. Reinstall the hoses, turn on water and check for leaks. My whirlpool 13kg top loader blinks, the pc board when plugged and it wont function. Can you tell us exactly what is blinking and how many times it blinks? What is the model number of your Whirlpool 13kg top loader? Telefunken washing machine is giving E 08 Error. What does it mean and how to repair? That error may mean a number of things… we believe the washer was made by Hoover. May be wiring, motor, drum shart, or board. Check all wiring to be sure all is secure, connected and not damaged. Thanks, the water pressure is fine and it actually E11 error that is showing and the model of my washing machine Midea TG 70-10703L. Please any tips on fixing it will much appreciated. Midea TG 70-10703L E11 error code relates to a motor fault code. This can also mean an issue with the water coming into your washer. Recheck all wire harnesses for being loose or damaged. This video is for Hoover but may assist you in fixing your washer…. Midea 7kg front loader washing is showing E11 error message, please any tips on how to fix this problem? For your Midea washing machine 7kg, the only close error code we can find is E1. Are you sure the error is E11? If it is E1… it means the water pressure coming into the washer is too low. Westpoint washing machine is giving error code E2 after draining. Can you give us the make and model number on your washer? How to repair E11 error in Electrolux front load washing machine? Press the “Start” button on the washer to stop the beeping. The “E11” error occurs when the washer takes too long to fill with water. After a set amount of time, the washer stops filling and will automatically drain if not enough water has been added. Locate the water faucets that go to the washer. Turn the faucets to open to supply the most water pressure into the washing machine. Check the hoses to see if they’re properly attached and there are no leaks behind the washer or with the connection. My washing machine name is Konka, it shows E4 error code and does not function. Please what do i do? What is the model number of your Konka washer? It is a Chinese brand and is not very reliable. Is this your Konka washer? Is it model number XQBK60-666? My Speed Queen Dryer has error code E 5H. What does this error code mean? Speed Queen Dryer with error code E 5H = The SH error is telling you there is a dead short in the temperature sensing circuit. For us to supply more info, we need the model number of your Speed Queen Dryer. Help please! My Daewoo DC model number DWF-901m, isn’t spinning? Are you getting any error codes or flashing lights that may indicate the problem? Is the washer filling with water? I have a Maytag front load washer and dryer. Did a load of laundry and all was good. Went to do a load of hand wash delicate the machine started up then I got a beeping noise, then I got a W code and then a F code. It just sits there flashing the codes. What does this mean? Is the error your getting just and “W” and then “F” or is there a number after it? Please supply us with the model number of your Maytag washer. Help! Have a Whirlpool front-load washer. Getting error code “Lc”, and washer won’t start. Any ideas? For an LC error code on a Whirlpool washer, press and hold the End of cycle signal button for 4 seconds to see if that resets the washer. Let us know if it worked. I’m getting this same LC error on my whirlpool front loader. I tried pushing the button for 4 seconds, but it is still not working. I have an automatic industrial washing machine with model number XGQ-25F and MADE IN CHINA. It says FAULT ALARM, #54 SYSTEM ERROR in the front panel, please can any one help me out of this problem? For us to find the error code and give you the right info to repair your Chinese Industrial Washer, please tell us if this is your china XQG-25F washer… Is that it? Let us know when the error happens by telling us at what stage you get the error code. Got an E2 error code on TECO 6kg top load washer, model TWM60TA. It fills up, starts wash but won’t drain. Check to be sure the drain hose on your TECO washer is not crimped or bent thus preventing water from exiting. Check that the drain pump is not jammed or obstructed in any way as this will cause the washer to not drain and the error code will occur. Do you get the error code once the washer attempts to drain? Videocon top load washing machine 6.5kg… Getting the E5 error code. E5 error code on some brands of washing machines could mean the water heater of the machine is bad, but on another brand it could mean that the debris filter is clogged… so check the machine for both as this error code is not in our database. Error code H11 is not in the Panasonic Washing Machine Error Code Database…. Try unplugging the washer for 5 minutes and see if it clears. If not let us know and we can go from there. Error code E32 on Toshiba Washer means an issue with washer load size and balance… See image and link to Toshiba Washing Machine Manual. I have a front load whirlpool washer.. Sometimes nf error code pops up.. Not sure why. Can someone give me an ideal?? The error code on Whirlpool washer NF means “no flow”. Check to be sure you have proper water pressure. Turn off the water vavles to the washer. Remove the hoses from the washer. Turn the water on and put one of the hoses inside a bucket to test water pressure. If you have good water pressure then check the water valve inlet screens. They are located on the water inlet valve where the water hoses connect. The screens prevent hard water from clogging the solenoid valve. You can visually inspect the water inlet screens if you remove the hoses. If they are not clogged you may have an isssue with the water inlet valves. Check with a meter and check they are not clogged as well. Our whirlpool cardio washer won’t drain the code reads SD also have another that reads f5 and e3. I need help I can’t keep buying washers. Whirlpool Cabrio SD error means that is is a SLOW DRAIN. Check drain pump, and drain hose. Whirlpool washer error code F5 E3 is a door unlock error. Maytag Alpha error code Lc is nowhere to be found. What does that mean? This is the first time that the washer has broken after two years. Funny, I had my old Maytag top loader for almost 20 years with never a problem. Please supply us with the model number of your Maytag washer. What happens exactly when you get the LC error code? Does the lid lock? At what point in the wash cycle does the Lc error code happen? A fault with the heater element. Replace the heater element. The door interlock switch is faulty. Need help!!!! My Samsung front load code has been nd not draining. Okay I just replaced the pump and started a load I did normal cycle and it stopped on 33 then coded nd. What can I do. Power failed and it is letting you know…. reset it by pressing and hold the start or on button for a few seconds. Aspira TWLWP60 – Wont drain or spin . After the wash cycle , it just stops . Then after 2-3 mins ,E 1 comes up on the ” mins left ” window . I have a Kenmore top load but I don’t see the code im looking for, but it won’t spin on any of the cycles and does everything else. It also leaks from the bottom when the water is going in. Whirlpool front loader – Error code f6 and E2 the machine is only 4 yrs old. Communication between Central Control Unit (CCU) and User Interface (UI) has not been detected. Verify continuity in cable between CCU (UI7) and UI (C2). I have a Samsung vrt washer that I’ve had for three years. It stopped working and is flashing EE (I think the first letter is an E because the top of it is cut off) with a little picture of a sand timer thing next to it. I don’t see the EEv code on your list. The motor hums when i turn it on but then the code starts flashing. Please help. Amana front load washer stopped mid cycle with a strange error code that I can’t find. It is an upside F followed by an E. Any thoughts? Are you sure the error code on your Amana washer is an upside down F with an E after it? If so that shows it MAY be a thermistor error. It is a temperature sensor and is located at the bottom front area of the tub. Check it to be sure it is not broken or has loose wires. Let us know what you find. I have a problem of code error E5 in Imesa washing machine, and i got the details of error code that E5 stands for temperature sensor. Can anyone help me to get the of location of temperature sensor in Imesa washing machine ASEP 2000. You may be able to find the parts breakdown for your Imesa washing machine here and be able to locate the temp sensor and be able to remove and replace yourself. What is the error code 106 for Whirlpool duet washer? Most likely you are seeing the error code F06 not 106. My LG washer 2487HWM gives me diagnostic codes IU:0I and IF:AI. Can you tell me what these mean? The first display indicates the units model designation. The second one you are seeing is the control board version. These numbers and letter combinations have nothing to do with error codes. Error codes are two digit combinations not 3, 4, or 5. There are no error codes for IF:A1 or IU:01. When you start the QC test be sure to listen for the lock engageing. If you do not hear it lock then that is the problem. Replacing the lid lock assembly will fix your problem. I have a LG washing machine model WF-T857. When I turn the power on it just displays F. Before this started happening, during washing, the machine would stop at rinse or spin cycle. The power continued but the machine would just hum and not do anything, I was turning it on and off until it started displaying the F sign. Any tips and recommendations please? Thank you. LG washing machine error codes are in a 2 letter format. Are you sure there is not another letter after or before the F error code? Replaced rotor and hall sensor on LG WM2501HVA. Get LE error. Run self test protocol and it displays codes IF:A2 IU:02 and Id:02. Can’t find a source for what these codes are. Main control board bad maybe? The LE error code on your LG washer display indicates the motor is locked. Performing a reset on the washer may resolve the LE error. -Unplug the washer from the power outlet. If the outlet cannot be reached, turn the circuit breaker to the unit off. -With the power disabled to the washer, press and hold the START/PAUSE button for 5 seconds. -Plug the washer back in, or turn the circuit breaker back on. -The washer should now be reset and the LE code cleared. If you replaced the rotor and the hall sensor… try this reset procedure anyway, if this does not work the next indication of part to replace is the control board. Be sure all wire harnesses are connected secure before ordering a new board. Thanks for the reply. I feel I have sufficiently checked the wiring harnesses and was thinking that the control board was the last culprit, but hoped for a bit of agreement before I drop the cash on the board. The resistance checks good on the leads to the stator, and at the motor connector at the control board, and from what I’ve read it seems the stator does not readily fail. I have a Kenmore front load HE washer model #592-49356 that is showing me a code of Lo after a few seconds of the machine turned on. I was washing clothes and it stopped mid cycle and showed me a nd code so we did everything we had to and the code went away but then this Lo code came up. It is on warranty but there are no technicians in our area to work on it. Can you help? The door fails to unlock after 7 attempts. -You will usually need to force the door open. -This often damages the door lock/switch assembly. -Replace the Door lock/switch assembly if it’s damaged or defective. My Daewoo washing machine(up loading) Dwf-200ps-220) not spinning well and their is water under the drum. Check lid switch and motor, belt, all internal parts. If the drum leaks, then possibly a hose is not connected properly and a simple screwdriver to tighten the clamp will fix it. Is your washer filling with water? There are 2 codes for your Bosch washer and one of the FO2 errors means no water – no fill. Be sure the water is turned on, inlet hose is not kinked, the filter is not blocked on the inlet hose or water pressure is too low. Kelvinator washing machine model no kt60flgl show e3 error……means what and what I do?????? What does Singer washer E3 code mean? How to fix it? What is the model number of your Singer washing machine? You are getting an E3 error code on the screen? Please explain. I have a Kenmore washing machine HE, it shows error 05 when machine starts. Water is on and start the motor just one round and it shows F05 code. The 05 error code on your Kenmore washer means you have a water temperature error. Consult your manual to check the sensor for proper operation or a loose wire harness. Whirlpool washing machine Flt sports model. Problem is When Machine starts only spin, water is going out, drum is not rotating. Getting error code F1. If your Whirlpool washing machine is showing the F1 error code this means the control board isn’t fully able to communicate with the motor. Can you give us the model number of your Whirlpool washer so we can help further? E3 error code flashing on my Scanfrost washing machine SFWMTL19. Please could you help? It washes for a while and then stops, displaying E3. We believe the error code E3 for your Scanfrost washer means a drain pump / motor issue. You need to be sure the drain pump is clear of debris, clean out filter if applicable, and make sure the drain hose is not clogged or bent. Check all the above and get to us if the problem persists. I can’t figure out how to read a fault error code for my Whirlpool washer. It is flashing Fill and Wash then Spin and Done. What would this fault code be? Please help! Can you give us the model number of your Whirlpool washer? Different model numbers can mean different errors. Let us know and we can assist from there. Please also tell us at what point does your Whirlpool washer flash Fill and Wash then Spin and Done. I have a 2 month old Kenmore Ultra Wash Model #665.1347 that is flashing error code E2 and F2 back and forth. None of the buttons on the control pad work. Can you please let me know what this means and how I can fix it? The E2 and F2 error codes for the Kenmore Ultra Wash indicates a drain issue. Unplug the washer and try to do a reset. Unplug for 10 minutes and plug back in to see if it will clear the error codes. Check that the washer is able to drain properly by checking the drain hose and the drain pump. Be sure the drain hose is not bent or crimped. If your washer has a front drain filter, make sure you clean it out and be sure it is installed correctly. The drain pump may also be blocked from an object getting stuck in it. Check all the above and if your issue does not go away, let us know and we can assist further. My Samsung front load washer is plugged in but no buttons work or light up, I heard I had to push the “pulse” button but am unable to locate it. If your Samsung washer is plugged in and no lights come on, have you made sure the breaker for the washer is turned on? Make sure it is on. If so, and the washer will not power on, let us know and we can assist further. As far as we know, there is no “pulse” button on a Samsung washer. I have a Bosch Washer Logixx 8 Varioperfect It is coming up with an Error code E61. It is flashing and beeping three times every minute or so. I am unable to open the door at all even after trying to switch off at the main. Bosch Washer F61 error code is a door lock malfunction. Unplug the washer and open the door and there you will see the door lock hole. Slide a screwdriver into the gap and wiggle it from side to side in case the door switch is stuck. Plug the washer back in and retry the washer. If still the same issue then the door lock is bad or the control board is bad. I have a new DECO Washer/Dryer combo with a error code “E5” Model 206189543. From the database we are using, the error code E5 on your washer means there is a malfunction with the motor. (You may want to consult your users manual to be sure the error code we have supplied is correct.) Have a look at the motor and be sure the connections are tight and test to see if it is getting power. Let us know what you find and we can assist further. LG washing machine error code is “lr”. Please assist. Can you please give us the model number of your LG washer once again so we can research your error? Also tell us exactly what the washer is doing at the time of the error? My LG front load washer shows Lr error code? Please help me? Are you sure the error code showing up on your LG washer is Error “Lr” and not “LE”? My washer machine show f9 and E1 how can I fix that ? My Samsung front load washer shows LF error code after 7 minutes on normal cycle. I changed to rapid wash with a 30 minute cycle and it worked okay. The normal cycle is 59 minutes. Any suggestions? Was the error code on your Samsung LF or FL? LF is not common but means LONG FILL. This may mean that you have a clogged water hose inlet screens or an issue with the water inlet valve. See this page for more help. Washer fills slowly. Kenmore K714WM14 110918 Error code E21 need to complete the wash! 5 month old machine. Kenmore washer Error code E21 means long drain time error. If the washer is not draining properly check the drain hose for kinks or clogs. Make sure that the washer drain is not clogged or restricted. Check the installation of the drain hose. You may need to check the actual drain pump for clogs if the hose is not clogged. My Samsung washing machine has an error code DE door not close. The door is closed and nothing is in the way. It closes perfectly fine it’s not full. Any suggestions please? Most likely your door switch is faulty or the wiring harness is not attached properly. You will need to check the wiring by opening the machine up. Remember to remove power first. If you find all the wiring secure and in place, then test the door switch with a meter to see if it is bad. Can you supply us with your IMESA washer COMPLETE model number? Also be sure error code is not PL S and not PL 5. What is exact error code? Scanfrost washing machine is not draining and need to know what went wrong with the machine. This is the first time of using it. You may have an issue with the drain hose, drain pump, or an electrical issue. Unplug the washer and look at the drain pump and hose to be sure it is not clogged. Also, if there is a filter, clean it out. I have a samsung top load washer. I am getting a PE error code.. Is there anything i can do my self to fix it.. This PE error code means the control board is not detecting that the clutch motor is working properly. The problem may be in the wiring. You will need to take the panel off, access the inside of the washer and check all wiring harnesses to be sure they are secure. If all wiring is secure, you will need multimeter to check the ohms and continuity. I followed your recommendations step by step, when the panel board came back to life and error code started blinking I pressed on the power button to reset nothing happened. Unplugged the washer and the humming noise started again. So I did the 3 buttons 3 times again waited 10 mins. Humming noise stopped and when the error codes started to blink, I pressed the 3 buttons 3 times and machine is back to normal. Regarding the warranty, my wife bought the washer in L.A. and had it shipped all the way to the Marshall Isles so I don’t think the warranty would’ve worked all the way out here. Thank you so very much for your help in getting our life back to normal and now with clean clothes. I started my whirlpool duet steam washer without turning on the water. The washer door is locked. I unplugged the washer and tried to start again with water on. Nothing happened but a humming sound. The washer door is still locked. There is no cancel/pause button on the washer. F8 E1 showed on display. What can i do to get machine going again? Try and press the “Drain and Spin” button on the washer’s panel to try and unlock the machine. This may drain any water that could cause the machine to remain locked. Once the “Drain and Spin” cycle completes, the door should unlock. Pull down on the bottom panel and pull it away from the washer. Reach through the open panel and up to the door lock. There is a release pull ring there. Find the release ring below the locking mechanism. Pull down on the ring to unlock the door. DID 1 LOAD WITH NO PROBLEMS THEN NEXT LOAD WASHER FILLED UP, THEN STOPPED. NOW ALL IT DOES IS MAKE A HUMMING NOISE WHICH SOUNDS LIKE IT IS COMING FROM SOMETHING LOCATED UNDER THE DRUM. HAD TO REMOVE BACK AND TOP COVER TO UNLOCK THE DOOR TO REMOVE WET CLOTHES. F8 followed by E1 code displayed but water supply okay. No clogs or kinks and water pressure is normal. Did the solution on the trouble shooting but still not working. First of all if it is new, isn’t it under warranty from Whirlpool? Push “Wash Temp”, “Spin”, “Soil” three times in a row. The control panel MAY come back to life again. The error code will be cleared and you should have a working washing machine. To clarify a little better, push “wash temp”, then “spin” then “soil”. Do this three times. You may have to wait 10 minutes for the drain pump to stop before you can clear the code and get the machine working again. You made sure both hot water and cold water is on and flowing into machine, correct? If none of this works you may have an issue with the water inlet solenoids. Let us know what happens.